I actually thought it was not possible but the song today was actually worse this week than the prior week. This was not an easy goal to achieve! Interesting how we sang in several keys without any sense of harmony or timing. However, we get a metal for trying. Sadly, Tom Mangold informed us that Ed McCauley, a former member of our club expired and his funeral is scheduled for Saturday, September 17, 2016 at 11:00 AM Beautiful Savior Lutheran Church, 7570 N Thorndale Road, Tucson, AZ. Members are invited to attend if you knew Ed. Guests introduced: Le Craven, Alzheimer’s Research and Prevention Foundation Manager, Kirti Khalsa, CEO, Alzheimer’s Research and Prevention Foundation, Eric Miller (potential member) and David Hindman. David will be inducted next week during DG Sheryl’s visit. John Dooling reported he is having an open house at his home this Sunday from 2-6 PM in honor of guests from Natal, Brazil. Patricia Gurgel and her spouse Jr. will be staying at his home this weekend. There will be a special board meeting, September 19, 2016 at Mary’s home to meet with District Governor Sheryl Christensen. All committee chairs, and board members are requested to attend and supply Mary a hard copy report for her to review and give to the governor. The governor will meet with the club next Tuesday at 7 AM and it is important that all members attend. PDG Randy discussed typical Rotary protocols as it relates to governor visits. It was requested that members and friends attend the poker tournament, September ……… The Alzheimer’s Research and Prevention Foundation donated $100.00 for advertising. We had happy bucks and as always much laughter and excitement as John Dooling pulled the card to see if he would be an instant millionaire. No such luck, John, sorry. Introduction of Kirti Khalsa, our guest speaker from the Rotary Club of Pantano and the Alzheimer’s Research and Prevention Foundation. Kirti discussed our club sponsored “Memory Screening in Mexico,” Nevada and a potential one at the Rotary convention in Atlanta in June 2017. We are simply waiting for approval for a booth from RI. This booth will be a feather in the cap of the Rotary Club of Marana. Kirti discussed why she cares about Alzheimer’s disease. She discussed her grandparents and how she has always had an affinity for older people and was drawn into the field. 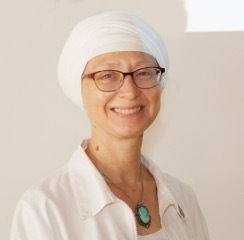 She is now an expert and known throughout the world for her knowledge of yoga, meditation and Alzheimer’s related issues. She described how dementia is preventable and can be slowed by using the four pillars of intervention: Diet, Stress Management, physical exercise and spiritual fitness. Meeting adjourned and all encouraged to attend the meetings next week for the governor’s visit and installation of our new member, David Hindman.